Stagnation in the Russian economy in 2013 prompts economists and historians to look back at some lessons of the past. 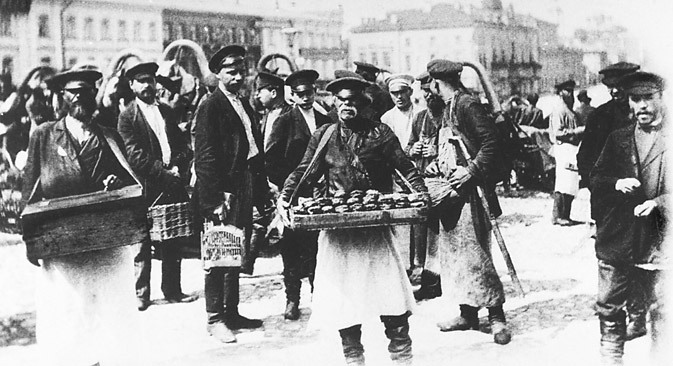 Just 100 years ago, the Russian economy was demonstrating a high growth rate. The whole world was closely watching the birth of "the Russian economic colossus." In 1913, the main drivers of growth were demand on the domestic market, an inflow of foreign investment and budget spending. That was known as a "catching-up development model." In modern Russia, the authorities are faced with similar tasks, today known as modernization. In 1913 Russia was the world's fourth largest economy after the United States, Germany and Great Britain, and accounted for some 6 percent of global gross domestic product (GDP). In terms of foreign trade, Russia was the sixth largest player in the world, with the trade itself constantly on the rise, and export becoming one of the factors for expanding industrial production and mining. The average growth rate of the national economy between 1880 and 1913 was more than 5 percent, one of the highest in the world. A great economist of the first half of the 20th century, Alexander Gerschenkron, described this type of economic growth as "a catching-up development model." At the time agriculture in Russia remained one of the most successful sectors of the economy. Russia was the world's leading producer of rye, the second biggest (after the U.S.) producer of wheat, and the world's leading exporter of grain and butter. The monetary reform conducted by Finance Minister Sergei Witte in 1895 to 1897 and the introduction of the "gold standard" created favorable conditions for attracting foreign capital into the country. The State Bank of Russia never failed to meet the requirements of the gold standard, exchanging - without any restrictions - banknotes for gold and coins. As a result, before World War I foreign investors had absolute trust in the Russian ruble. Nowadays, at a new level in its historical development, Russia is facing similar tasks. The main driving forces behind Russia's industrial growth in 1913 were capital investment, budget spending on infrastructure projects and inflow of foreign capital. Whereas now capital investment in Russia is falling, budget funding of infrastructure projects went up only after President Vladimir Putin's speech at the St. Petersburg international economic forum in June 2013, and capital flight still considerably exceeds capital inflow. At the same time it is the inflow of foreign capital that the government sees as an important indicator of trust in the national economy and a key driver of growth. Russia in 1913 was short of capital, so the main capital-intensive projects, which had an effect on the strategic development of the national economy, were financed by the state. For instance, large-scale railroad construction was financed from the budget. A railroad network linked the country's western and central regions to the Caucasus, Central Asia, Siberia and the Far East, which in turn served as a boost for developing their natural resources and involving the local population into economic activity. Modern Russia's equivalents of these projects could be the construction of a liquid natural gas plant in Yamal or oil production in the Barents and the Kara seas. Like 100 years ago, these capital-intensive and technologically challenging projects are being implemented with the participation of public and private capital. In 1913, defense spending made up some 30 percent of the budget, which is why since then the Russian economy can be described as militarist. The fact that defense spending is now growing too, primarily through budget allocations for purchasing new domestically manufactured weapons and military hardware, shows that now, like in 1913, the defense industry is playing an important role in ensuring economic growth. At the start of the 20th century, foreign capital from France, Germany, Belgium and Great Britain played a key role in creating the heavy industry in St. Petersburg and Moscow, as well as in Donbass and the South Caucasus. Another important factor for boosting economic growth back in 1913 was a drastic reduction of imports and moderate protectionism. A hundred years ago Russia did not fully manage to implement the "catching-up development" model, which largely relied on creating a major national industry and large-scale internal sources of economic growth. At the time, the national economy very much depended on agrarian exports and foreign investment. That was why with the start of World War I in August 1914, the Russian economy found itself in a difficult structural crisis, when an inflow of investment dropped considerably, while the grain harvest in effect never got exported. The main drivers of growth for the modern Russian economy are exports of raw materials (mainly oil, natural gas and metals), as well as budget spending and a growing consumer credit borrowing through private financial institutions supported by the country's monetary authorities. At present, Russia's economy is the sixth largest in the world, after the U.S., China, India, Japan and Germany. It is very likely that Russia has joined the circle of the world's biggest economies for a long time. Furthermore, there is every reason to believe that during a period of 10 years, it may become Europe's biggest economy, leaving Germany behind. The problems in the modern Russian economy have to do with the remaining institutional limitations to its development. It needs better competition and stronger efforts to break up monopolies, a reduction in corruption and a balanced development of the banking sector. Russia's accession to the WTO in 2012 created opportunities for removing barriers to developing trade in goods and services with the world's leading economies. Still, the Russian government is yet to prove how serious it is with about its commitment to integrating the country's economy into the world economy. Stanislav Tkachenko is a PhD in economics, assistant professor at St Petersburg University's Department of International Relations.